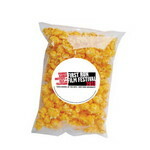 For those who a snack that's easy to handle, we offer our promotional popcorn gift sets, printed with your business logo. 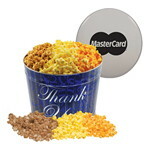 It makes sense to buy these affordable popcorn sets in bulk so you can share them with customers, employees and anyone else who you want to thank. Our promotional popcorn gift tins allows you to showcase your company in a fun and affordable way, while still providing a tasty snack. Our promo bags of popcorn come in a wide variety of styles, including single ready-to-eat bags, microwaveable popcorn bags, and in various flavors. This 3 way Popcorn Tin contains more than 2 pounds of cheese, butter and caramel covered popcorn. This personalized gourmet butter popcorn single is a 1.5 oz. clear bag filled with popcorn. 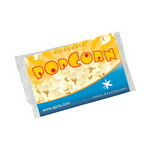 The promotional gourmet caramel popcorn single is a 5 oz. clear bag filled with popcorn. 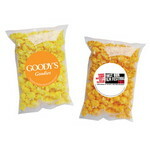 Our custom logo gourmet cheese popcorn single is a 1.5 oz. clear bag filled with popcorn. This personalized microwave popcorn flat is a bag of the microwaveable snack. 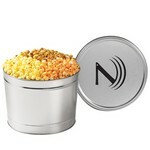 Our custom logo two gallon popcorn tin is filled with freshly popped corn in butter and cheese flavor. 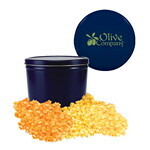 This personalized two gallon popcorn tin is filled with freshly popped corn in caramel, butter and cheese flavor. 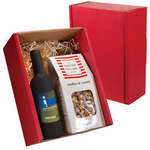 Relish your favorite drink wherever you go and share a snack with your loved ones using the Gourmet Popcorn & Wine Tool Gift Set. It includes a Bordeaux Wine Tool Set and a 7 oz.